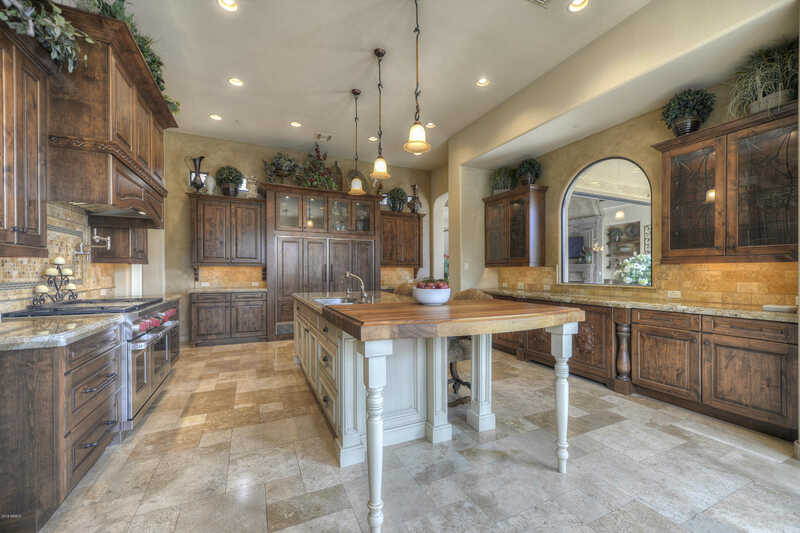 Private Estate w/Views located in the prestigious gated golf community of Pinnacle Canyon at Troon North. Elegant but casual lifestyle w/courtyard entry. Desirable N/S Exposure, open Great Room & split Master w/exquisite finishes & attention to detail. Gourmet Kitchen w/large island, 2 sinks, slab granite counter tops/butcher block & breakfast bar & area. Wolf gas cooktop, dbl ovens, side by side Sub-Zero. Kitchen open to Great Room w/automated pocket doors, gas cantera fireplace. Atrium w/fireplace. Butler’s Pantry w/built-in coffee maker, refrig & sink. Formal Dining Room w/brick ceiling temp-controlled Wine Room. Home Theatre. Master suite boasts fireplace, sitting area, dual vanities, closets, water closets. Resort Backyard w/pool, spa, BBQ, firepit & View Deck w/FP. Views! Directions: East on Dynamite to Alma School. Go South (Right) on Alma School to 108th PL. Take Right. Go thru Gate & Continue straight thru stop sign. Continue to Whitethorn to home on Left. Approximate size: 27801.00 sq. ft. Please, send me more information on this property: MLS# 5867328 – $1,899,000 – 10715 E Whitethorn Drive, Scottsdale, AZ 85262. I would like to schedule a private showing for this property: MLS# 5867328 – $1,899,000 – 10715 E Whitethorn Drive, Scottsdale, AZ 85262.